PROPELLER PORTABLE COMPUTER PRODUCTS, INC. NOW PROPELLER, INC. Since the beginning, Propeller, Inc.’s roots have been in the computer hardware business. Our understanding of the computer hardware and software distribution chain has helped our clients take advantage of the market for more than 25 years. We have since grown to become familiar with consumer electronics, medical, toy, nutritional supplements and other distribution chains to provide even more help with Warehousing in Utah county. 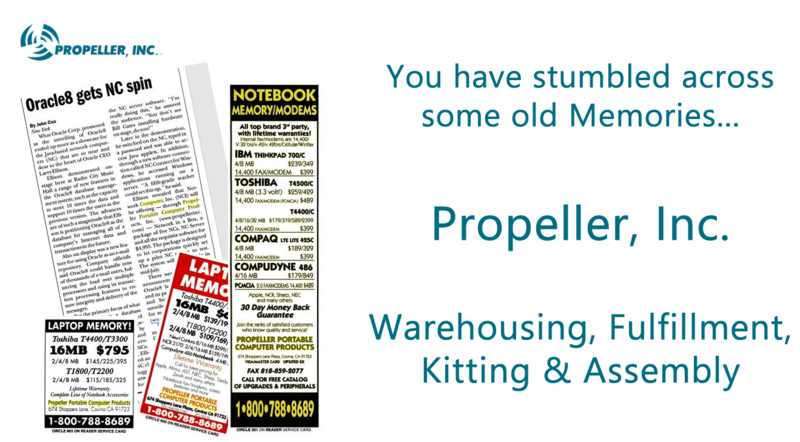 YOU HAVE STUMBLED ACROSS SOME OLD MEMORIES OF PROPELLER, INC. It has been a long time since we offered the Network-in-a-Box or sold 16MB of ram for $795 in the PC World Classifieds. We are innovators who have worked in the big leagues during the dot com era, an era the shaped us into a world class logistics company. Strategically choosing to place our warehousing in Utah County, we are able to conveniently access most of the United States and beyond.